Brokenness is a heart condition...Jesus is the remedy and His cure guarantees eternal life! When we invite in The Great Physician to perform His spiritual surgery, we receive a heart healing that includes redemption, restoration, rest and peace beside the still waters of an everlasting love. Won't you implore The Balm of Gilead to apply His healing ointment to your wounded heart and release you from your affliction? There is so much comfort being directly in the center of His will. When we are all-in and all about His will there's no greater place to be...He provides everything! 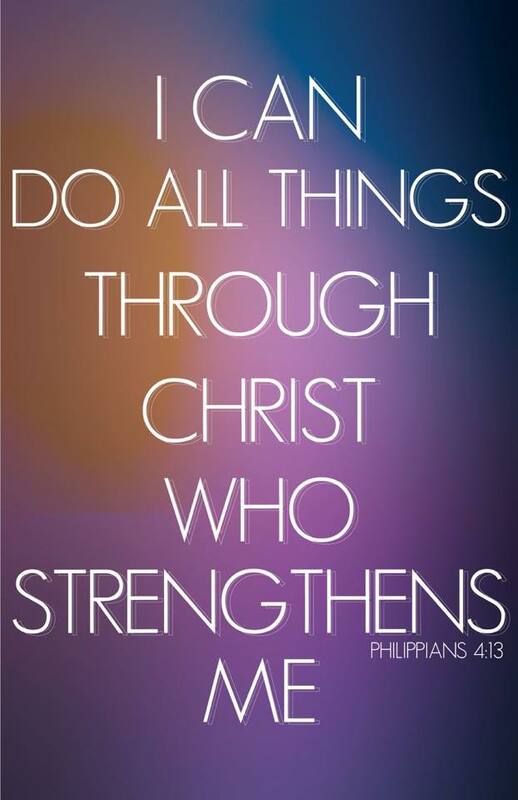 He provides the power to carry out the calling. He provides the grace to abound in every aspect of our lives. 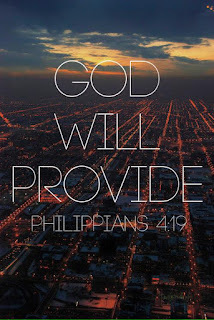 He provides every physical need you could possibly imagine and every financial need is met or exceeded in abundance. 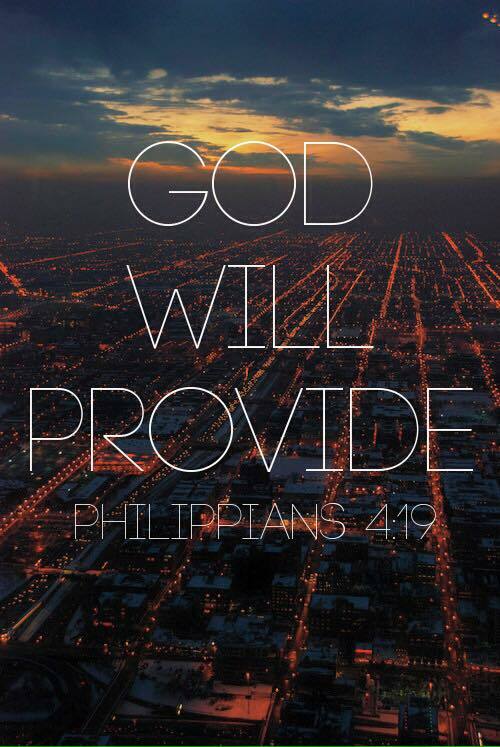 Nothing lacks His provision! 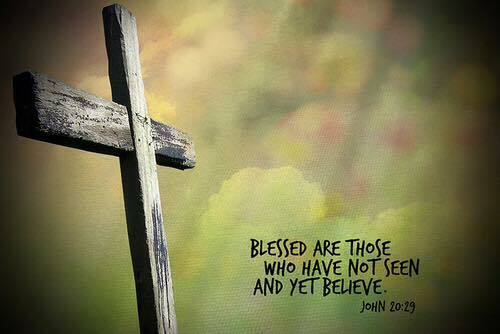 And above all, we are blessed and honored to be used by the King of kings! O what glory He deserves! I pray that today and every day we will become more aware of who You Are...Your Grace, Sovereignty, Power, Protection, Eternal Love and Mighty Mercy...may we learn to not place limits on You and what You alone can do in us and through us in order to accomplish Your Perfect Plan. I pray that in those moments when we are at our weakest, we will have a willing heart to receive all that You are; partner with You, and walk in Your Peace and Strength. Remind us, Lord, of who we are in You...that we are already overcomers through the Blood of Christ...and may we become more aware every day of who we are in our true, authentic identity in You. I praise You and thank You, Father God, for all that You Are today and every day and for Your Precious Promises and our adoption into Your Kingdom. In Jesus Christ's Holy and Righteous Name...Amen! It is only natural in our humanity to feel doubt, uncertainty and even fear concerning what tomorrow brings. But this we know...we can stand firm on His Promises...HE GOES BEFORE US and if He is with us, NOTHING CAN STAND AGAINST US! He IS THE GREAT I AM, the same yesterday, today and tomorrow. 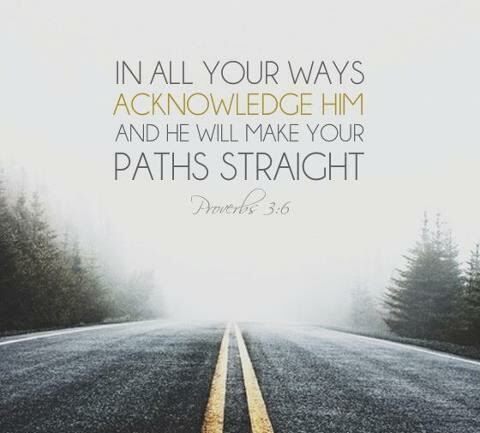 He has unlimited, divine resources and has already prepared the way! He has worked out EVERY SINGLE DETAIL in advance to accomplish His Purpose! 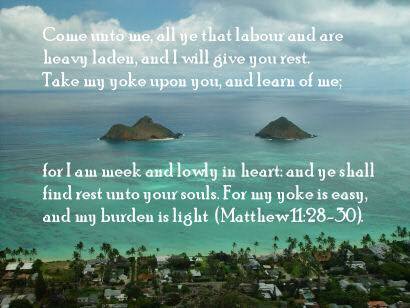 At the end of the day, we must keep this perspective and rest assured in His peace. No matter what today or tomorrow brings, this physical life and all the issues that come with it are just temporary...through the Blood of The Lamb, we are already entered into The Kingdom of God! God created us as free-moral-agents...free to chose eternal life or death...free to chose Fruits of The Spirit or the "forbidden fruit" we are confronted with each day...free to chose Him. Ironically, when we exercise our free will and chose Christ and the authentic path designed for us long ago, we experience the HIGHEST FORM OF FREEDOM! In His love for us, Abba Father God not only gave us freedom of choice, but a way out when we get derailed and chose the wrong path! What love! A boat doesn't sink because it is in the water; it stinks because the water gets into it. In the same way, we don't sink because we live in a sea of corruption, we sink when the sea of correction has gotten into us. We don't fail because we live in the world, we fail when the world has gotten into us. 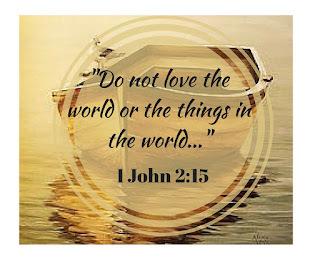 It can happen without realizing it we become preoccupied with things of the world rather than things of Christ and little by little the chilling waters of the world creep in. Just like any ship that has a pump constantly running and sucking out any water, we need to pump this water out by constant repentance. 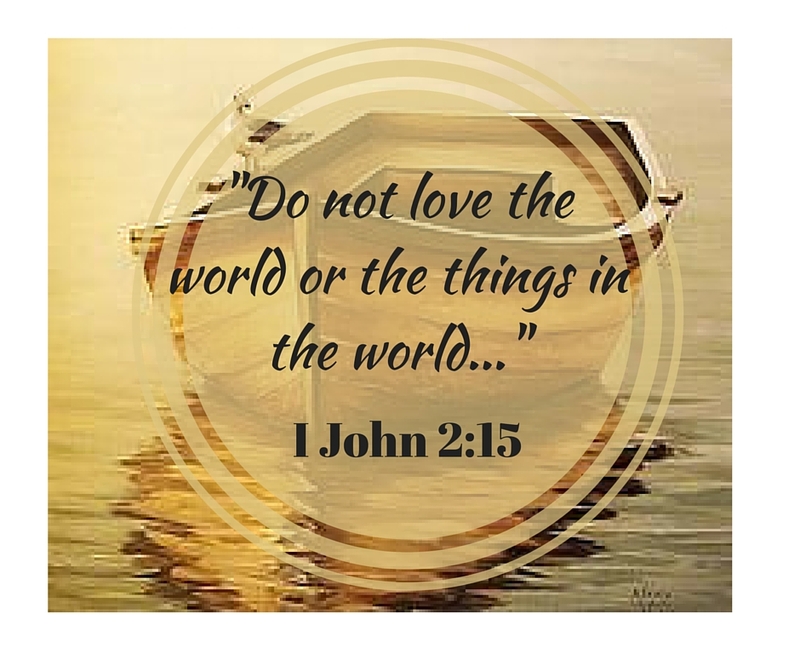 Don't let the world sink your ship... Repair and plug the holes with the word of God and the will of God! "JESUS SAID"...That's all we need! Isn't that just how we work? 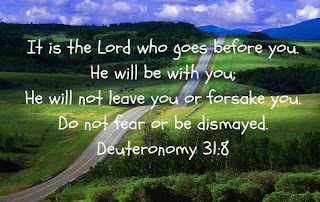 Jesus promises something and it's only after we see the whole plan unfold we go back and remember the promise He gave and the word to be true. We are a society and world that is always asking for tangible proof. 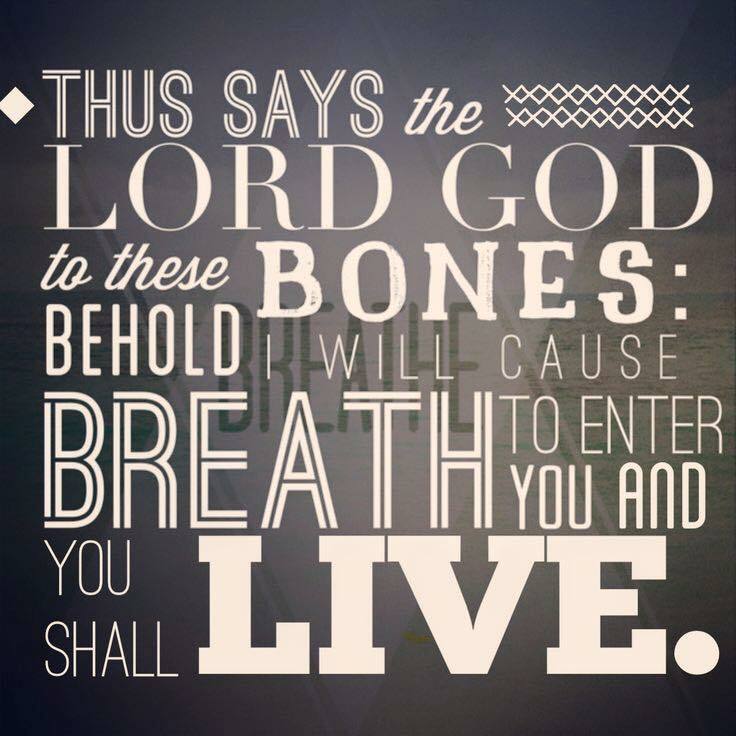 Why is it we cannot trust in what the Creator of the world says we He tells us He will bring something to pass? Where's our faith? Faith comes by hearing and hearing by the Word of God! The problem with leaning on our own understanding-it is finite, fallible, subjective and limited. However, as we get to intimately know our God and His character, we can trust in Him and His infinite knowledge with all of our hearts, and trust that He will direct our paths. He is perfect. He is mighty to save, He is all powerful, He is all knowing and He is our Rock and stronghold. He knows the beginning from the end. He is rich in love, mercy and abounding in grace. 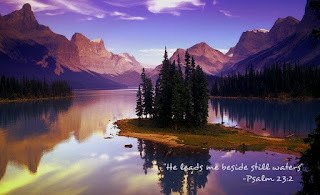 When we acknowledge Him for all that He is and His praise be on our lips it brings about a peace which directs our steps. He makes our crooked path straight by His still voice and faithful promises. 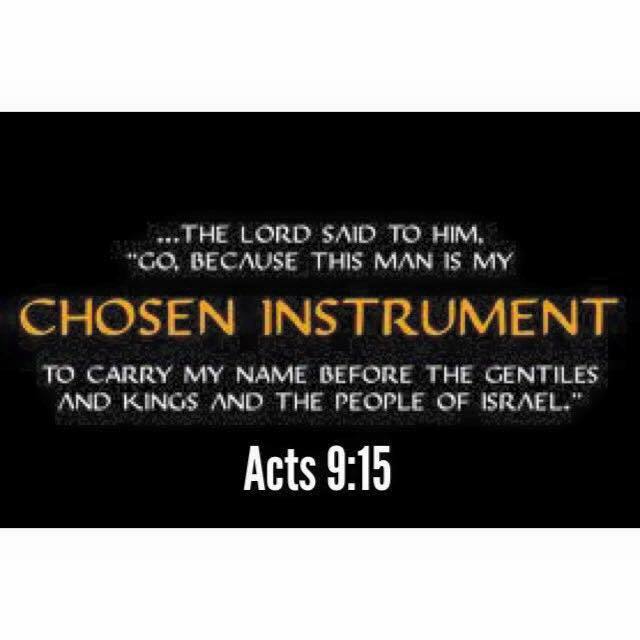 On the road to Damascus we see one of the greatest conversions and transformations recorded in the Scriptures. Saul who threatened, persecuted and murdered disciples of the Lord was converted to (Paul) one the most power vessels of honor and glory for His Lord Jesus Christ. 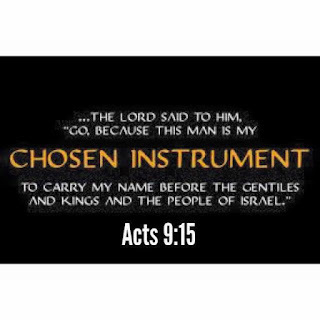 This is more then a story of transformation, it is a story of the great mercy and redemptive power of Jesus. Paul encountered the great mercy of His Lord, the love of His Savior and here his crooked path became straight...God met him, God chose him, God showed him grace, God showed him mercy and all marveled at the glory of God! 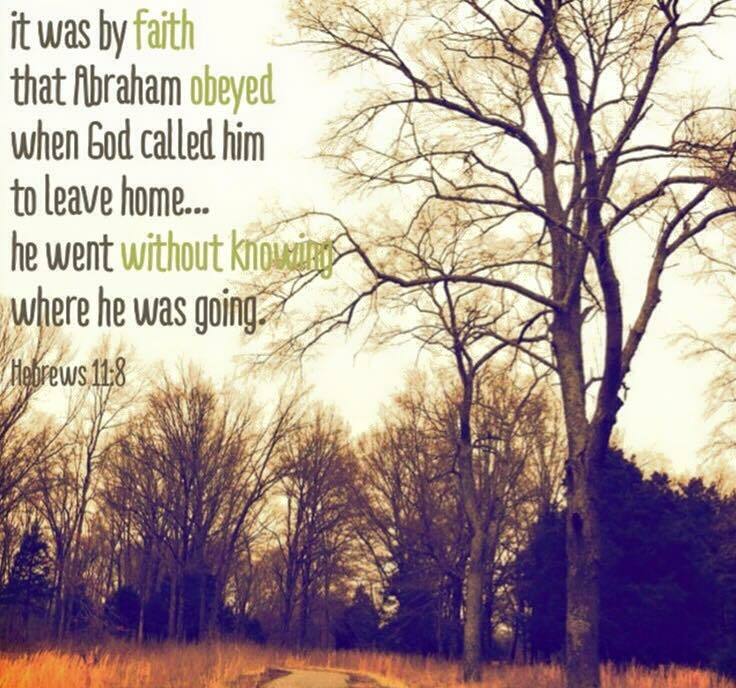 Abraham on so many occasions displayed remarkable faith. 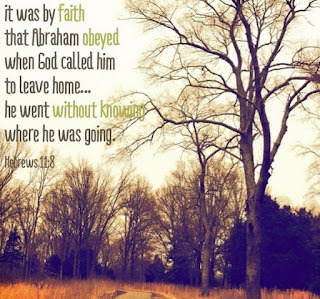 If we want to learn how to step out in faith we must look no further than Abraham. The God of glory appeared to him and said "Get out of your country and from your relatives and comes to a land that I will show you." (Gen 12:1) Without question, without doubt, without specific direction, without instructions how to, without even knowing where he was going, Abraham got up and obeyed God. Why? Because he knew His God. He knew His God was a good God, a promise keeper, a faithful God, a trusting friend, the lover of his soul, his alpha and omega. God knew the beginning from the end and God knew exactly what He was doing. God also loved Abraham and had good plans for His life to prosper him and give him and future and a hope. This unwavering intimate knowledge of his God was the solid foundation on which Abraham got up and went without even knowing where. God knew and that's all he needed! Some of the most powerful healing can come through the most painful of circumstances. One of those extremely painful circumstances is grief but we have not to look further than Jesus and His word for healing. Mary was distraught and beside herself with grief when Lazarus had passed away. But what she did was not run and yell at Jesus, not turn away from Him, not call Him names or question Him. No, she ran and fell at His feet grieving and sobbing. Humbly at His feet He met her. Jesus wept. 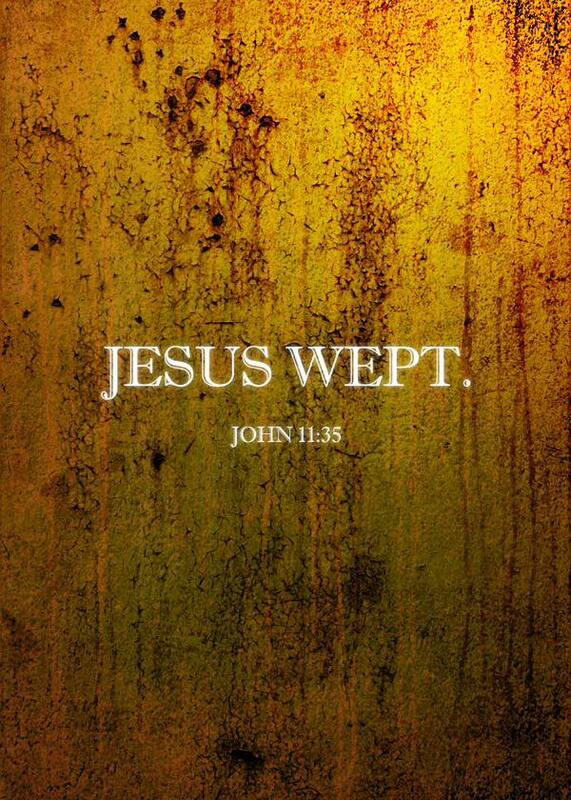 Jesus wept the tears with her, He groaned and sobbed the same pain and from here the healing took place. He gave her the only thing that could heal her-His Comfort, His Love and His promises! And one of the most profound miracles recorded happened! 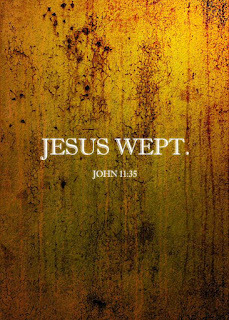 Weep at the feet of Jesus...here lays the comfort, love, healing and promise of hope that with His tears will wash away grief. 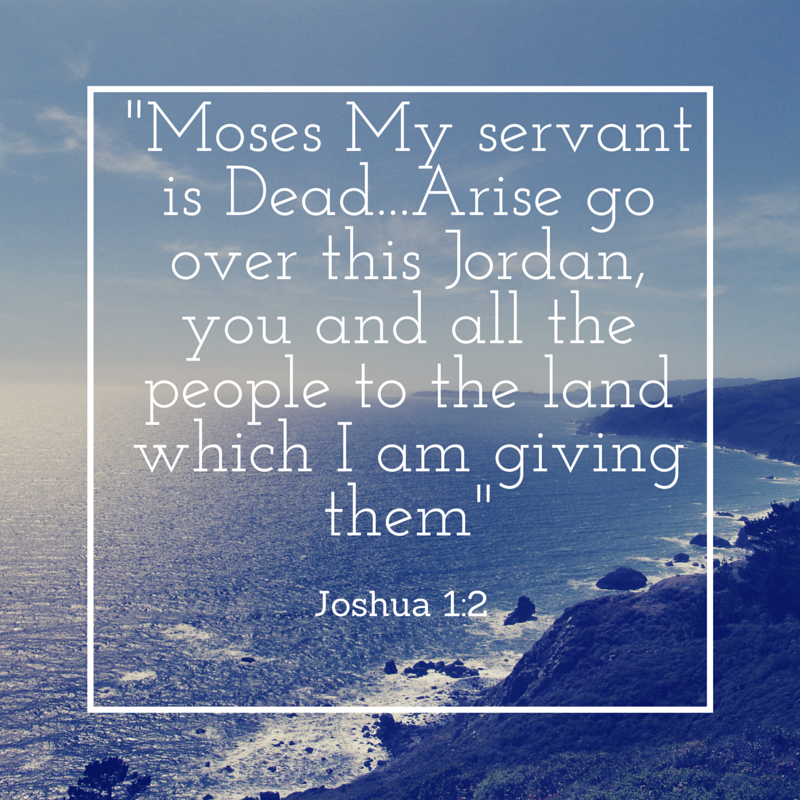 God was announcing through the prophet Ezekiel that Israel seemingly "dead" would be restored to life. 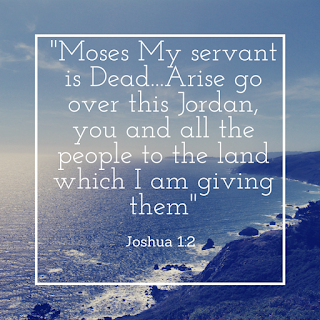 However, this promise seemed impossible in light of Israel’s present condition. She was “dead” as a nation, deprived of her land, her king, and her temple. BUT GOD...God's Word went forth, He directed Ezekiel and Ezekiel obeyed- the bones came together and breath entered the bodies, and they stood up in a vast army. New life depended on God’s power and Ezekiel's obedience not the circumstances of the people. God’s Spirit is in the business of resurrection! This same power rose Jesus from the dead! This same power lives in us! O Lord, May an army rise up! 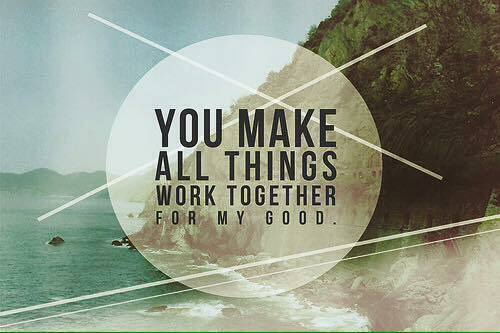 He says “we know” that all things work together for good. How can we know? We need to truly get to know the One who is promising to have a bold confidence and trust in the promise. 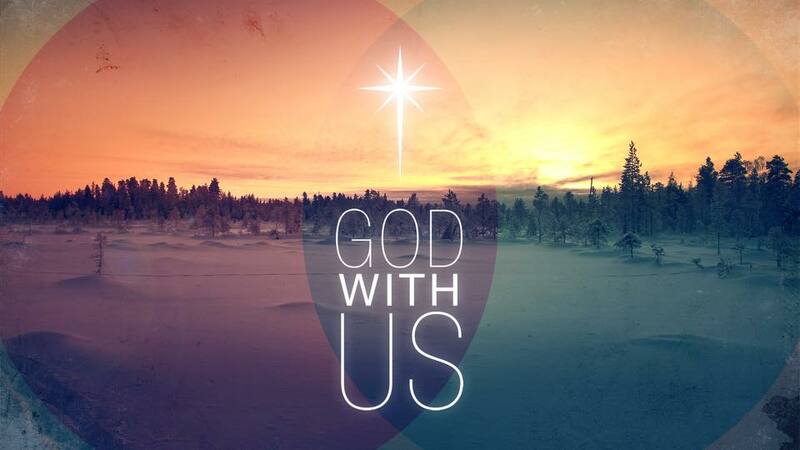 He is God Most High. He is sovereign over all things; over the heavens and the earth, over the sun and the moon, over the wind and the waves, over the trials and the pains. Nothing slips through His hand and nothing is wasted. This is an invitation to trust in His sovereignty, His unfailing word and His unwavering promises with confidence that He will use every fragment of our lives for His good purpose. He does not promise all things will be good however He promises to use all things to work together for good for those who love Him. He will use every suffering, every trial, every pain, every hurt and every tragedy for His good purpose. He will turn beauty from ashes as we put our hope and trust in Him alone. The love that endures long and is patient with each other. The love that is kind and compassionate. The love that is not envious nor jealous. It is not boastful or rude, it does not display itself in vain, it is not conceited or arrogant and inflated with pride. God's love in us does not insist on its own rights or its own way, for it is not self-seeking but yet puts others needs before its own. It is not resentful of provoked; it takes no account of the evil done to it and pays no attention to wrongs . It does not rejoice at injustice and unrighteousness, but rejoices when right and truth prevail. Love that bears up under anything and everything that comes. It is love that is ever ready to believe the best of every person, it hopes under all circumstances, and it endures everything without weakening. This love never fails! 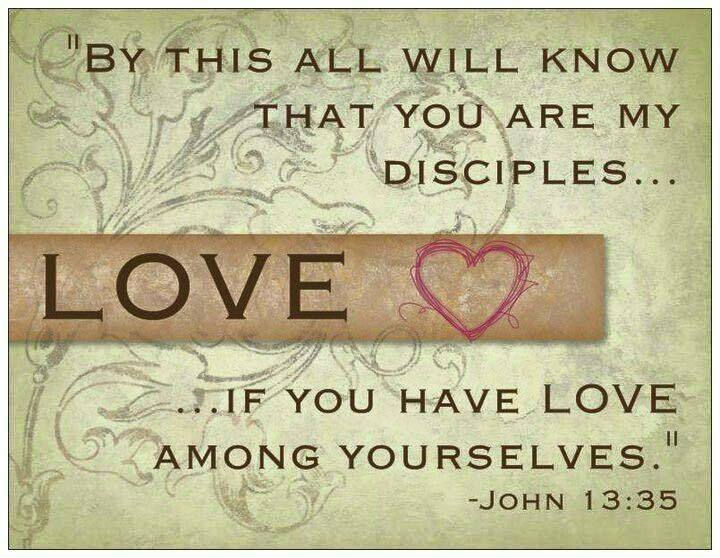 This is the love we ought to love each other with and this is love the world so desperate needs! Let your light and love shine before men so that they may see your good works and glorify your Father in Heaven! 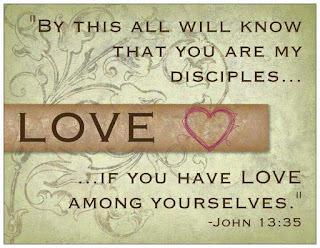 There was a time in my life when I could not love others or myself in the way God intended. I was giving the best wrong I had. My sin had caused me to separate myself from God and I was experiencing an identity crisis. I simply did not know that I did not know! Fortunately, God's hand of protection was on me. Just when I was not certain if things could get worse, He pulled me from the muck. In a moment of true surrender, I began to see what real redemption is, and it includes a transformation and restoration like I never knew existed! 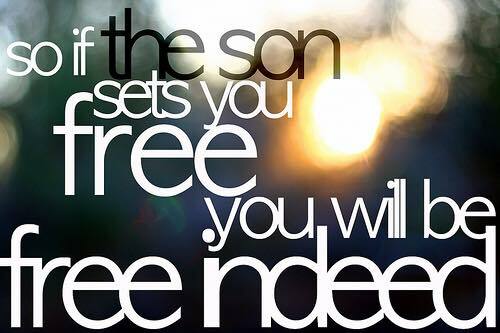 Once I was fully set free by The Son, I began to seek Him with all my heart. I was tasting The Living Waters of renewal and sanctification and, for the first time ever, I began to see myself as God sees me. I finally understood that my identity is hidden in Christ and experienced the gift of Grace! Once I saw myself through the compassionate Christ lens, I was then able to begin loving others as I love myself....to make an effort to look past the hurts...separate the sins from the sinners (including myself! )...trying to see my fellow human beings as God created them...and through God's Perfect Love, get past the differences that divide us and create confusion (tool of the enemy!). From that sprang a love for others that grows as I grow in my authentic identity. Friends, love and hate do not exist together. And when Jesus gave us this commandment, He did not discriminate. 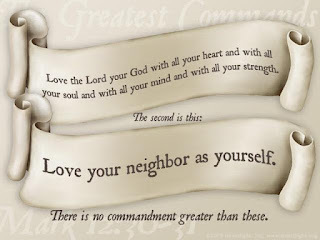 It is "love your neighbor as yourself" PERIOD! 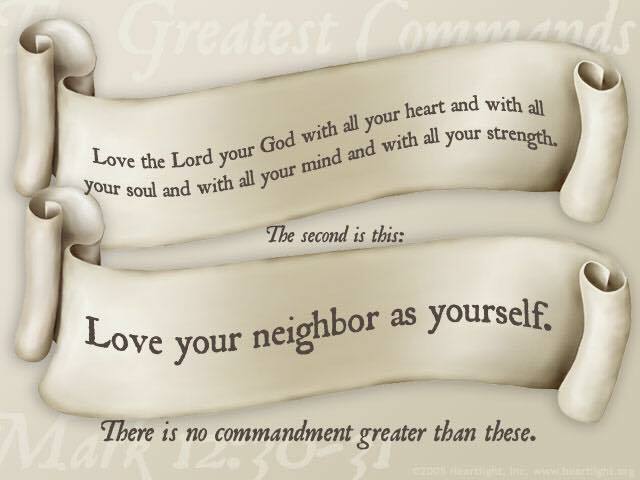 If we follow these commandments...love Him and seek Him first, we are able to unconditionally love ourselves and love our neighbor in the same way. 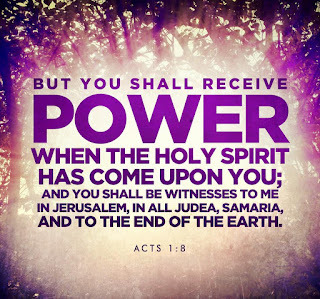 The Book of acts is the story of men and women who took that commission seriously and begin to spread the news of a risen Savior to the most remote corners of the known world. We are called to the same commission! Jerusalem -this was their immediate surrounding. Start here, right around you in the atmosphere you are in! Judea- this was their immediate region. Branch out and affect the region He's put you in. Only you are exactly in the area He has you. Samaria-this was the immediate Gentile region. What area of non-believers does He have you near. Who needs to hear the good news? 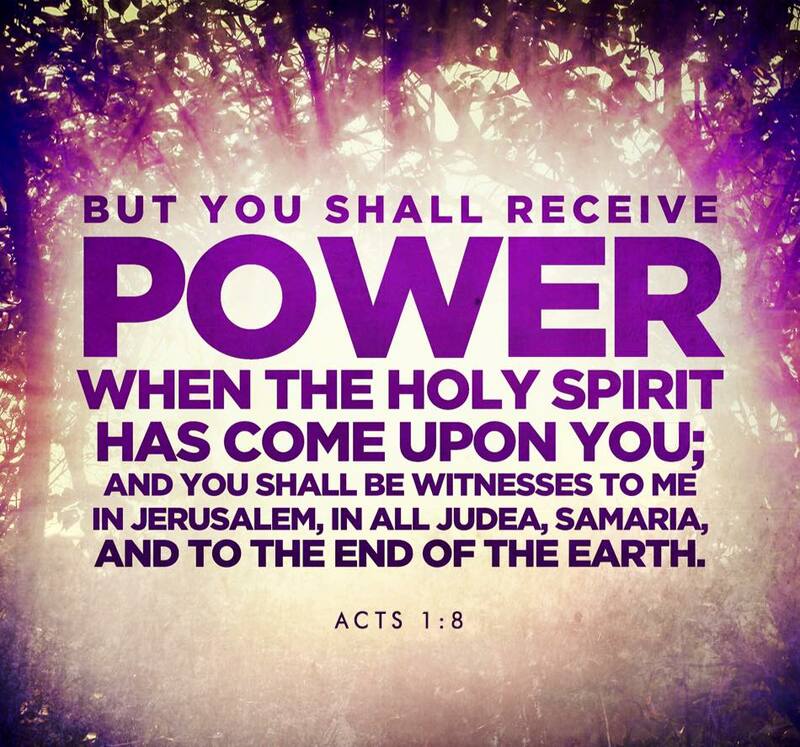 To the ends of the world-He wants to the world to hear the power of Christ crucified and Christ resurrected! Satan entices us with temptation, temptation leads to sin, sin to separation and separation to condemnation. Satan often takes our God given desires for love, acceptance, or value and offers a counterfeit version. He lures us away by our desires and makes temptation look so appealing. Temptation is not a sin. 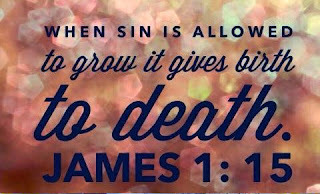 Even Jesus was tempted but it's when we act on that temptation that it becomes sin. 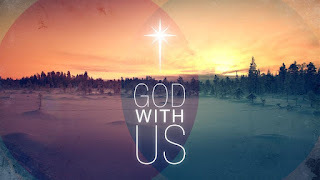 Now he has us right where he wants us-separated from God. Our holy God can't look upon sin and so that same separation Jesus endured on the cross for us we get a taste of. But Satan still isn't done. Satan is the accuser of the brethren. 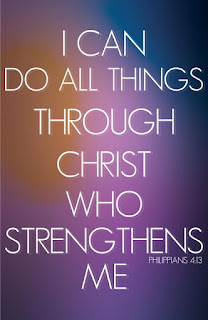 So he encourages us to submit to him and then discourages us and condemns us. He tries to convince us we are not even worthy of forgiveness and tries push us even further away. What deception! and He intimately speaks to us! Let your words be on my lips and your praise be on my heart! Our loving God gives us a choice but also makes it very clear there is One way that leads to eternal life and that way is Jesus. 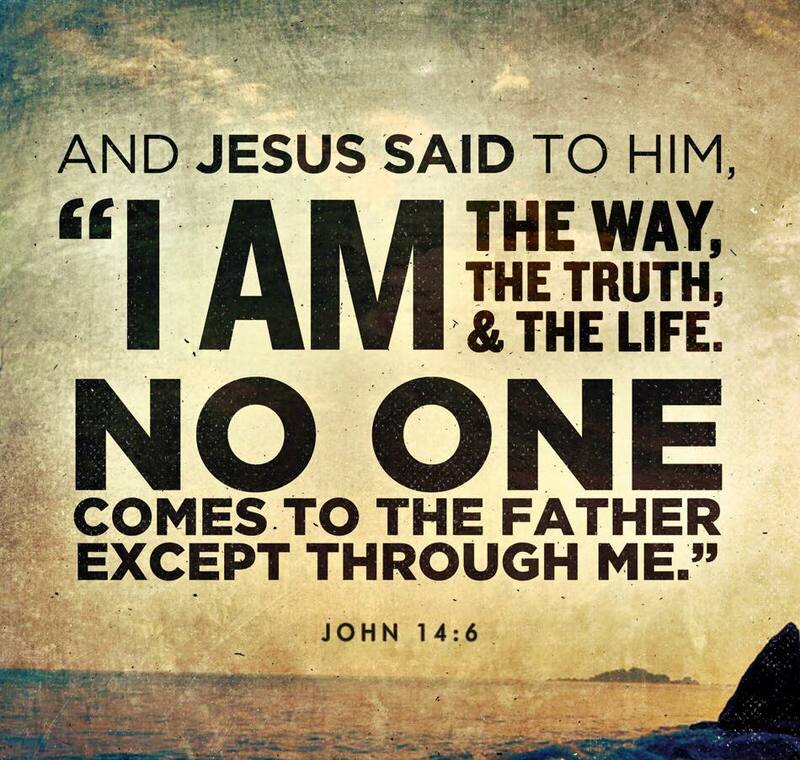 There simply is no other way or Jesus died in vain. 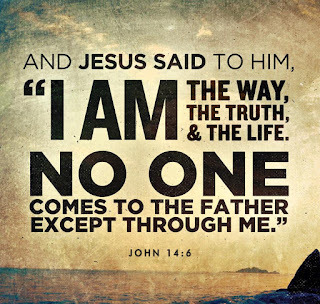 Jesus is "The Way" and "the" definite article is very clear there is only One way to the Father. One way from dark to light. One way from guilt to grace. One way from humiliation to honor. One way from death to life. “Sanctify them by Your truth. Your word is truth.” (John 17:17) Jesus is The Word (John 1:1), He is the Truth-there is no other doctrine nor is there any truth outside of Him "And you shall know the truth, and the truth shall make you free" (John 8:32). (John 6:47) He is the author, the source and the sustainer of life and apart from Him there is nothing. "When Christ who is our life appears, then you also will appear with Him in glory.” (Colossians 3:4) He is the Life! Sheep are very difficult to get to lie down. They will generally only lie down if there is nothing to fear, if they are at peace with the other sheep in their flock, if they are not harassed by flies or parasites and if they are not hungry. Praise Jesus our Good Shepherd that ensures all of these needs are met for His precious flock to have us lie down and rest. "Green Pastures” was a place of trust, it meant that they had enough for this day and that they could trust their Shepherd for tomorrow's portion. This is a beautiful place to be as we trust wholly in the presence of our Shepherd to protect us from all harm while providing all of our needs, rest, peace, comfort and satisfy our hunger. The "Still Waters". A Good Shepherd would not lead His flock beside waters with raging currents that could carry them away and harm them- No he would lead them beside the still waters. A peaceful place of safety and refreshment. The waters of renewal and rejuvenation that would quench and satisfy their longing thirst.